Selected Works of Rebecca J. Gryka, R.Ph., Pharm.D., Ph.D. Objective. 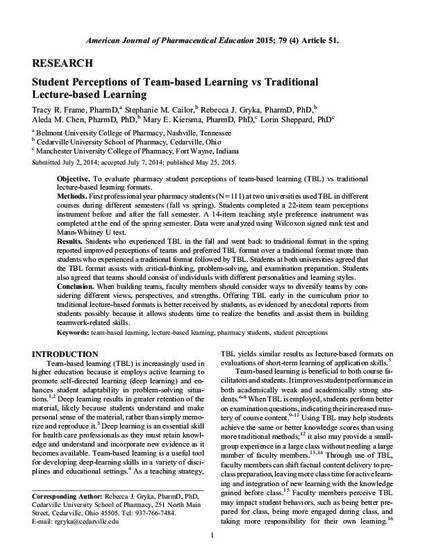 To evaluate pharmacy student perceptions of team-based learning (TBL) vs traditional lecture-based learning formats. Methods. First professional year pharmacy students (N5111) at two universities used TBL in different courses during different semesters (fall vs spring). Students completed a 22-item team perceptions instrument before and after the fall semester. A 14-item teaching style preference instrument was completed at the end of the spring semester. Data were analyzed using Wilcoxon signed rank test and Mann-Whitney U test. Results. Students who experienced TBL in the fall and went back to traditional format in the spring reported improved perceptions of teams and preferred TBL format over a traditional format more than students who experienced a traditional format followed by TBL. Students at both universities agreed that the TBL format assists with critical-thinking, problem-solving, and examination preparation. Students also agreed that teams should consist of individuals with different personalities and learning styles. Conclusion. When building teams, faculty members should consider ways to diversify teams by considering different views, perspectives, and strengths. Offering TBL early in the curriculum prior to traditional lecture-based formats is better received by students, as evidenced by anecdotal reports from students possibly because it allows students time to realize the benefits and assist them in building teamwork-related skills. Contact Rebecca J. Gryka, R.Ph., Pharm.D., Ph.D.